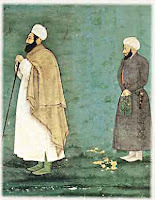 Ahmad-i-Faruqi Sirhindi (1564–1624) 'quddisa sirruh', an acme for gnostics (arifs), a guide for owners of haqiqat, a paragon for the Awliya-i-kiram, a beloved of Allahu ta'ala, the revitaliser and illuminator of the second Islamic millennium, a qibla for the hearts of those who advance in the way leading towards Allahu ta'ala is one of the greatest Awliya Allah, Friend of God. As his own spiritual guide, Khwaja Baki-billah 'quddisa sirruh' described him, "Ahmad is a sun outshining thousands of stars like us. There have been only one or two like him in this community. And today there is next to no one like him under the celestial dome. I look on myself as one of his satellites [pupils]. All his marifats are correct and approved by Prophets 'alaihimus-salam'." In fact, his master as well as his disciples would attend his sohbat in order to receive fayd and nur from him. His lights of Wilayat, his barakats of karamat are too occult to express in words or writing. "Let it be known to you that the Heavenly Guardians attracted me because They wanted me to be attracted, and They facilitated for me the passage through time and space (at-tayy) in the different states of the seeker. I found that God is the Essence of all matter, as it had been said by the People of Sufism. Then I found God in all matter without incarnation (hulul). Then I found God together with all matter. Then I saw Him ahead of everything and then I saw Him following everything. Finally I reached a state where I saw Him and I saw nothing else. This is what is meant by the term, Witnessing the Oneness, which is also the state of Annihilation (fana'). That is the first step in Sainthood, and the highest state in the Beginning of the Way. This vision appears first on the horizons, then secondly in the Self. Then I have been lifted to the station of Subsistence (baqa') which is the second step in Sainthood. "This is a station which many saints did not speak about because they did not reach it. All of them speak about the station of Annihilation, but following that state is Subsistence. In that state I found all creation another time, but I found that the essence of all these creations is Allah, and Allah's Essence is the Essence of Myself. Then I found Allah in everything, but in reality in myself. I was raised to a higher state, to find Allah with everything, but in reality He was with myself. Then I was lifted to see Him preceding everything, but in reality He was preceding myself. Then I was lifted to a state where He was following everything, but in reality He was following myself. Then I saw Him in everything, but in reality He was in myself. Then I saw everything and I didn't see God. And this is the end of the Stations by which They had brought me back to the beginning. In sum, they lifted me to the Station of Annihilation, then to the station of Existence, then they brought me back to be with people, in the Station of the common people. This is the highest state in guiding people to the Presence of God. It is the perfect state of guidance, because it matches the understanding of human beings." He said, "I accompanied today one who has reached the End of Ends, the Qutub of all Creatures, the Perfect Man, Shaikh Muhammad al-Baqi. Through him I received incredible blessings, and by his blessing I was granted a power of attraction that allowed me to reach every human being that Allah had created. I was honored to attain a station that combines the state of the Ending with the state of the Beginning. I achieved all the states of Seeking and I reached the Ending, which is the meaning of 'Reaching the name of ar-Rabb' (the Sustainer), by the support of the Lion of God, Asadullah, Ali ibin Abi Talib, May God ennoble his face. I was raised up to the state of the Throne, which is the Reality of the Truth of Muhammad , by the support (madad) of Shaikh Shah Baha'uddin Naqshband. Then I was lifted even higher, to the state of Beauty, which is the state of the Truth of the Muhammadan Qutbs, by the support of the Prophetic Holy Spirit." - "Moving to Allah is a vertical movement from the lower stations to the higher stations; until the movement surpasses time and space and all the states dissolve into what is called the Necessary Knowledge ('ilm ul-wajib) of Allah. This is also called Annihilation (fana'). - "Moving in Allah is the stage in which the seeker moves from the station of Names and Attributes to a state which neither word nor sign can describe. This is the State of Existence in Allah called Baqa. - "Moving from Allah is the stage in which the seeker returns from the heavenly world to the world of cause and effect, descending from the highest station of knowledge to the lowest. Here he forgets Allah by Allah, and he knows Allah with Allah, and he returns from Allah to Allah. This is called the State of the Farthest and the Nearest. - "Moving in things is a movement within creation. This involves knowing intimately all elements and states in this world after having vanished in Annihilation. Here the seeker can achieve the State of Guidance, which is the state of the prophets and the people following the footsteps of the Prophet . It brings the Divine Knowledge into the world of creation in order to establish Guidance. "The entire process is like threading a needle. The thread seeks the eye of the needle, passes through and then proceeds down to where it began. There the two ends meet, form a knot and secure the entire thread. They form a whole, thread, eye and needle, and any material they catch is sewn into the fabric of the unity." During his very early days of spiritual training under the guidance of famous spiritual Pole of his time, Khwaja Baki Billah, may God guard his soul, Shaykh Ahmad Faruqi received Naqshbandi training. He was given the remembrance of the heart (Zikr e Qalb) and while he was training for it, his inner heart was soon filled with Naqshbandi illumination. Because of his already attained high spiritual station through the training he received in other sufi tariqa's through previous spiritual guide of high stature, including that of his own father, Shaykh Faruqi's progress on the path was very rapid. Everyday he was ascending to a new station. During this time, while in a state of fana (annihilation / absorbed inwardly in God) he had a vision of a great ocean. In its shadow was revealed the pictures of everything in the cosmos. Gradually this state of vision was increasing. From some part of the night to the whole night he was in this state. When he described his state to his spiritual guide, Khwaja Baki Billah he said, "you have attained a special fana." After this he forbade him to continue any zikr. After that Shaykh Ahmed received Fana e Mostaleh (fana of convention). While describing its hal (state) his guide asked, "Is the whole universe appearing to you as one and undivided?" Shaykh Ahmed replied, "I am seeing it as one." Khwaja replied, "This is called fana fil fana, because while still in the body this fana is attained." All night Shaykh Ahmed remained in this state and next morning he expressed to his guide, "I am feeling the Presence of Haqq Subhanahu Tala (Absolute Truth, Glory be to It). After this a Noor (Light) of Pure Darkness manifested. This was encompassing the whole universe. When describing this state to Khwaja he said, "This Dark Noor's widening is gnosis of God (ilm e Ilahi). That is the vast expansion through the Essence of the Most Holy to everything in the created world. One has to make nafi of this expansion"
Then this Noor started to contract until it became a point. Hazrat Khwaja said, "Even you have surpass this point and have to come to 'state of affliction'." Shaykh Ahmed did the same. The point vanished, a state of affliction manifested. At this point, Tawhidi Shuhudi is attained, the Unity of Witnessing. At this station, God Himself sees (witness) Himself. When Shaykh Ahmed conveyed about this state to his Murshid, Khawaja said, "This is Naqshbandi Hudhuri (Presence). Naqshbandis call this Hudhur e Agahee or Hudhur e Beghaibat. This is the station of "Omega in Alpha (What is at End, delivered in the Beginning). This is attained in this tariqa upon entering. But in other tariqa one has to toil and strive very hard for it. Shaykh Ahmed attained this only in two months and few days. After this fana began again. This is real fana. At this stage the qalb (inner heart) expands so much that everything between the Prayer carpet (Farsh) to Foundation (Arsh), all appeared as a mustard seed. He saw himself and every object in the universe as 'Haqq' (Absolute Truth). After this, inside every atom and molecule he saw his reflection and himself appeared as the reflection of all of it. Then each atom and molecule expanded so much that inside each many universe can be placed. He saw himself and every atom and molecules in such an expanding light which entered into atom and molecules and every form and image of the cosmos became lost in this light. After this the self and the atom and molecules felt like the source of universe's energy. Hazrat Khwaja when described this state said that this is Tawhid e Haqqul Yaqin, The Unity of Certainty of Truth. This is Jamul Jam'a. After this the form and shapes of the cosmos which appeared as Haqq (Absolute Truth) appeared as mere illusions. At this his affliction increased many folds. He remembered a manuscript, "Nususul Hakam" where his saintly father spoke of and told him, "if you wish, you can say, 'Alam Haqq' (the universe is Truth), or "It is creation." From one perspective its Haqq and from another perspective it is created. And you may distinguish them. It is better in honor." He described his state Hazrat Khawaja, hearing which he said, "You state has not come to clarity yet. Unless you obtain the power to distinguish between what is real and unreal, keep busy with your work." Shaykh Ahmed mentioned about 'Nususul Hakam' and Khwaja replied, "The writer of this manuscript Ibn Arabi wrote about the earlier stage, not that of perfection." Shaykh Ahmed engaged in his inner work again. Through the grace of Khwaja Allah the Most Merciful showed him the difference between what is real and unreal. He separated Mawjud e Haqiqi from illusions and what rose from mind of sifat (qualities), action - he obtained from the Lord. Afterward all these sifat and actions started to fade until remained only One Being of Holiness (Ek Zat Pak). According to Khwaja this is the state of "Farak badal Jam'a", separation after gathering. Here is the end, here is the stage of completion. May the blessings of al-Fatiha be upon all the True Friends of God, thousand salutations to Khwaja Baki Billah and Shaykh Ahmad Faruqi as-Sirhindi. As-salamu aalikum wa rahmatullah wa barakat ya Awliya Allah. May You help us receive baraka from their faces that annihilated in You and subsisted in You alone O Lord. al-Fatiha!